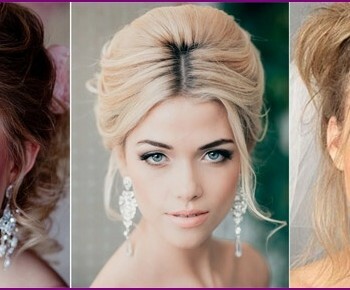 Make-up in the Greek style is very popular amongSuite. 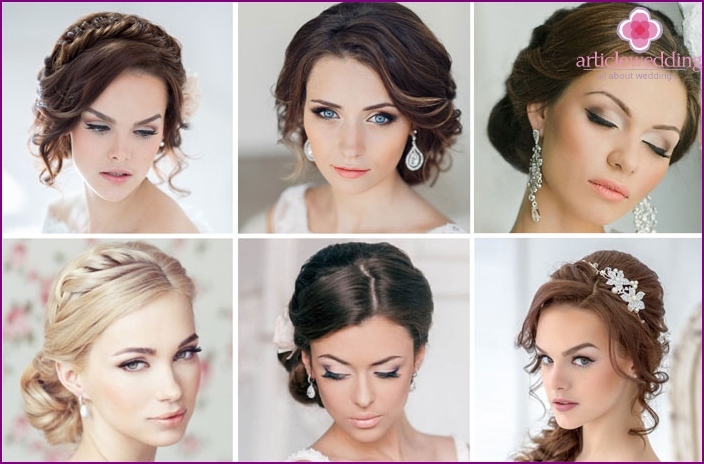 It is particularly suitable for brides who choose hairstyles and outfits that direction. Why Greek makeup so tempted us? 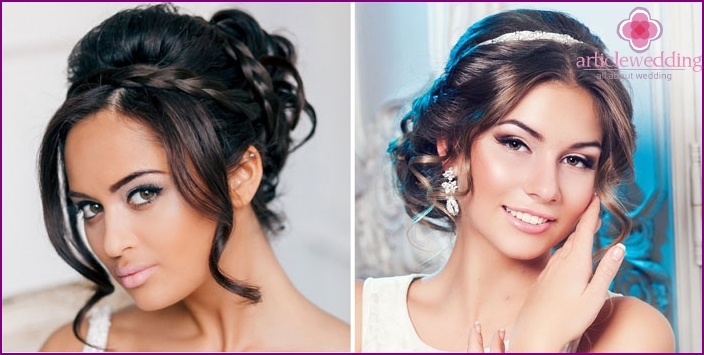 Ancient Greek women want to bring your own look for the beautiful and majestic face of one of the goddesses, and which modern bride wants to be in your wedding day divinely beautiful? natural color of the lips. 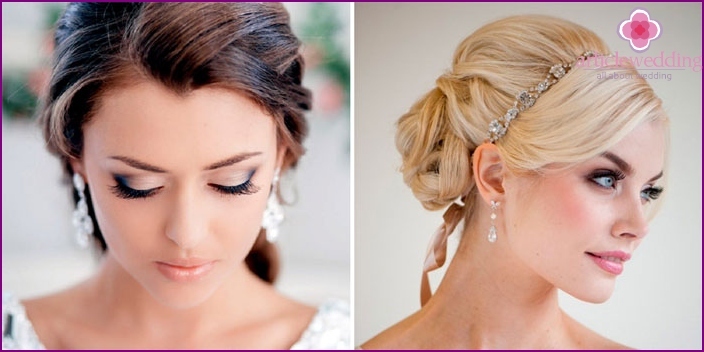 All the Greek style of bride elements shouldin harmony with each other. Successfully all this style looks on brunettes and brown-haired, rather than fair-skinned, fair-haired ladies. However, this does not prohibit blondes try on the image of the Greek goddess, but in this case given her eyebrows and draws the eye to the more restrained colors, choose a lipstick color is very gentle. It is very important in a wedding makeup skillfully GreekApply tone on the face, because this item is one of the most required. Render will not only skin, but also the shoulders, chest, neck, to avoid abrupt transitions. Emphasis is placed on the eye and eyebrow expressive, precise, they give the image of sexiness and confidence. For soft radiance impose foundation-fluid. It is better to choose a matting agent, which included are reflective particles. Using the equalizer mask the circles under the eyes, on skin imperfections. Using a fluffy brush Apply loose powder to fix the pitch. Take a highlighter and apply it to the middle of the forehead, the back of the nose, chin, a tick above the upper lip, cheeks, that will push the facial features of the first plan. 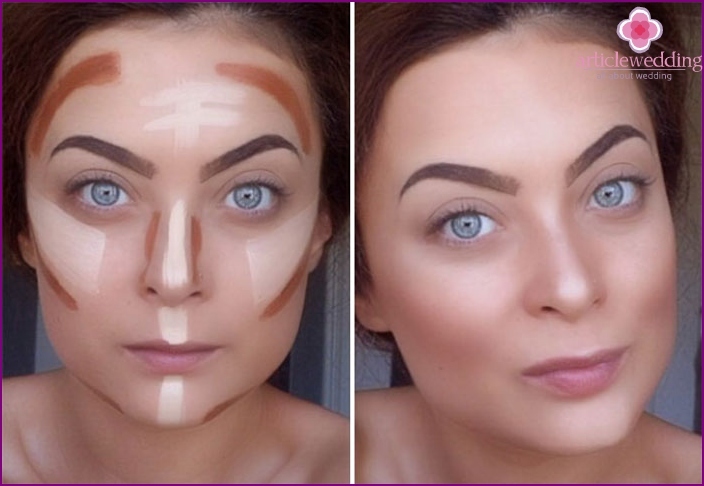 The means for contouring or bronzers highlight cheekbones, prorisovyvaya line under the zygomatic bone, blending it. Also darken the temples, nose, wings, oval face. This will make the lines more accurate. Perfect eyebrows make the face more than onceinteresting, beneficial shade her eyes. To do this, comb hair, we put under and above the eyebrow concealer. Suitable color pencil draw a curved eyebrow, if necessary, thickening and dorisovyvaya hairs. Shadow eyebrow gives volume, fluffy. With gel fix the result. To plot the eye golden shade on top and bottomever. Above the fold inflict brown matt, shading border. The pigment should be bright and soft at the same time. Draw an arrow liquid eyeliner or pencil from the middle of the eye, it should become thicker, extend beyond the outer corner towards the temple. The result is an almond-shaped. On eyelashes extension impose several layers of black mascara. To choose a lip matte lipstick warm tones. First, draw out lines around the mouth proofreader, shaded border. Powder lips lipstick to last longer and lay evenly. Trace the outline of a suitable color pencil, lipstick applied with a brush. In the center of the lower lip is allowed to add a drop shadow flickering, to add shine. To achieve the perfect eye makeup, nothurry. To create the perfect image, you must use basic color shades, such as matte browns, golden pearl. Often wedding eye makeup is complete without an arrow. It must pass a level line across the upper eyelid, a little comfort from the outer corner. So given the effect of the cat's eyes. The Greek style is different and sensualitytenderness. Because it is not necessary to allocate more lips than your eyes. During the day, apply a lip balm with a brownish or matte lipstick resistant light colors. When it gets dark, you can use a red lipstick with golden sequins. Gloss is not necessary to apply a thick layer, since the Greek style is not typical effect of wet lips. Not all brides will risk to do wedding makeupindependently. Sometimes you want to trust the professionals. Make-up artists in the arsenal have stable high quality professional cosmetics, have the necessary experience and skills to help them take into account all the features of make-up for special occasions. The eye of the wizard to quickly define your image, style, select these colors that will highlight your beauty and harmoniously fit into the image. 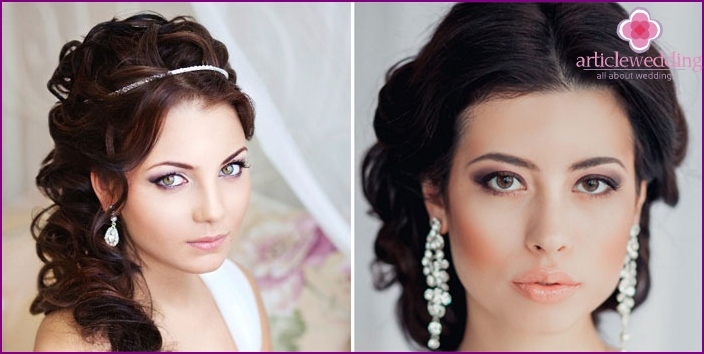 It is better to turn to make-up artist for a couple of weeks beforeevents, make a trial wedding makeup. In some cases the required facial treatments, which conducts the procedure for the recovery of the skin, their nutrition and hydration. Without perfect skin makeup will look stunning. 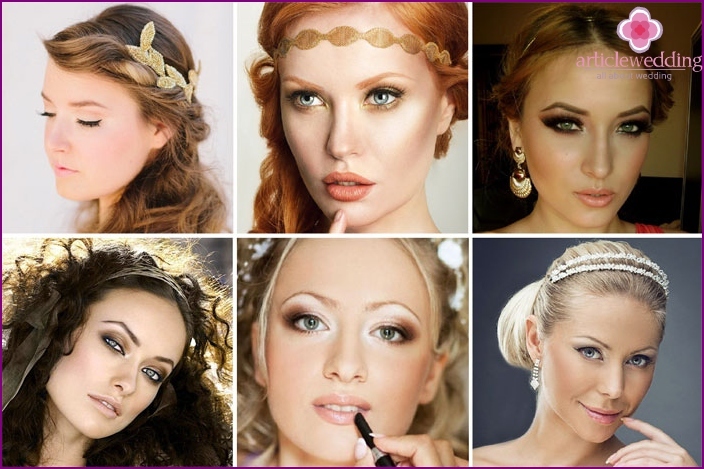 Makeup artist tell in advance of their intention to create for themselves the image of a Greek Goddess. When somewhere mentions the Greek goddess of loveAphrodite, what image pops into your head? In most cases, the imagination draws a slender beautiful woman with long, luxurious hair in flowing robes, with flawless features, captivating eyes and golden skin. The image of the goddess of Greek women was considered the standard of beauty. The modern bride is also not averse to try on a look of triumph at the expense of resembling a wedding dress and makeup, which highlights the natural beauty.